Owning a crappy old house will often transform you from an average construction dude to a sort of ad-hoc detective. Why is there a gas line in the front wall of the master bedroom? Why is there a different subfloor under the top of the basement stair landing? Why was there sewage intentionally being diverted into my walls? Why are their live wires dangling from the ceiling about 1/4 of the way off wall, in the middle of the living area? What I found was some badly damaged plaster, with some hot wires dangling out about midway through the room. This confirmed my suspicions since flooring cut outs at either side of the room. There was definitely a room divider in the downstairs space at one time. 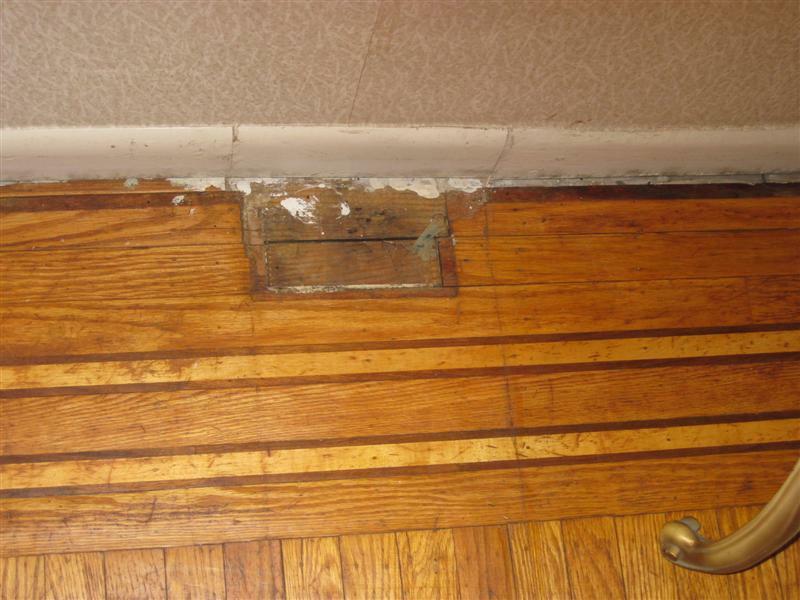 Notice the spliced in piece of baseboard as well, which is odd. 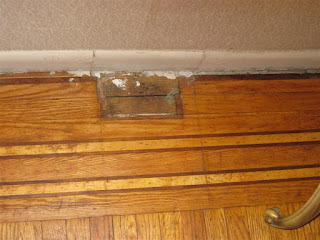 That would suggest that the room divider was removed after the replacement of the original baseboard. 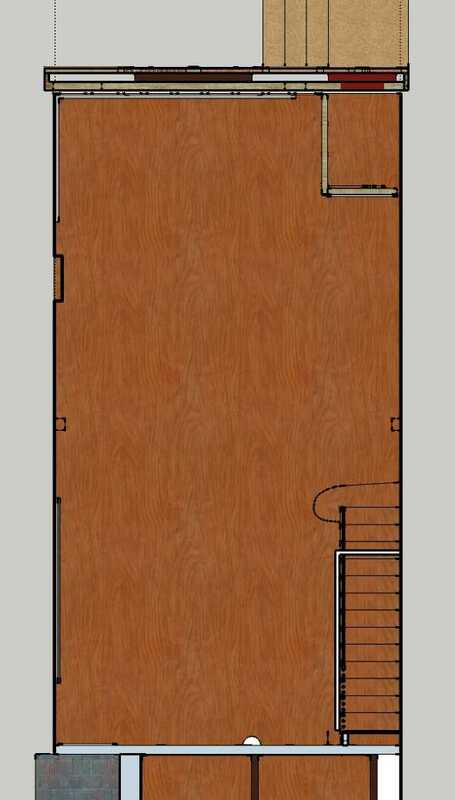 Let's cut to the chase here: I'd like to do a wall of built ins downstairs, and I'm thinking about re-incorporating a room divider to give the feel of a room transition, which out actually building wall that physically close of the space. In a row home, light is crucial and in limited supply. Since the back of our house faces south, I do not want to limit any light migration toward the front of our cave house. Scanned from my book "My big fat Greek-inspired room divider"
Something like the above photo might be sufficient enough. Perhaps without the circular columns. 2) I wanted to get a sense of how we would physically use the space before committing to a major renovation. Perfect right? No conclusions to help drive my decision. In fact, I can't even envision living life "normally" because I can't even remember the last time we did! We certainly haven't in this house! 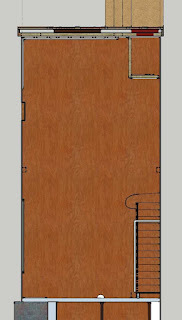 Floor plan drawing of the downstairs, notice the two rectangles midway down the party walls. This is the floor markings of the old room divider . The top of the drawing faces the street. Even without a solid game plan yet, I still think built in shelves would be a fabulous show piece for the house. I plan to build the built-ins just above the old room divider, along the left wall toward the street. I have already re-framed and sheetrocked the front wall. 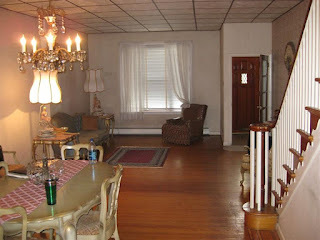 Foyer wall is still open (top right) while I am re-wiring the house. Anyway, stay tuned as I begin to post some drawings of this area as I design it. This is just the preliminary brainstorming.